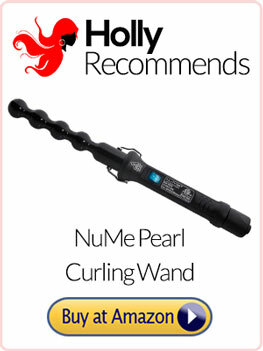 The Nume Pearl - Is This The Best Nume Curling Wand? What do you get when you combine a well thought out design, innovative technology, and the passion to come up with products that can truly satisfy customers? Nume’s Pearl Ceramic Tourmaline Infused Curling Wand is the result, and this is the ultimate product for those who need a curling wand that can satisfy all of their hair styling needs. Finding the right hairstyle and more importantly knowing how to achieve this on your own is not as easy as it seems. Different people will look good in different hairstyles, because there are quite a number of factors that have to be taken into consideration: face shape, hair length, and others. One hairstyle that suits one person beautifully could look laughable on another. NuMe knows this all too well, and this is why they put great value on innovation and individuality when it comes to their styling products. NuMe endeavors to provide the best hair care possible and this translates to innovative technology, professional techniques, and well crafted designs in all of their products. Basically, NuMe’s styling products are all carefully crafted to give meticulous styling care that is individually suited to the needs of those who will use it. The Nume Pearl curling wand is just one example. Let’s take a closer look. Nume Pearl Curling Iron – Now Available at a Great Price on Amazon! For the Nume curling wand to achieve the voluminous and luscious curls that it is well known for, it needs the right kind of technology that you can hardly find in any other product. NuMe has designed this wand with negative ion technology, which enables you to get the lasting curls that you want as quickly as possible. It also reduces static, which makes your hair so much more manageable with a lot less static. Another feature that makes the Nume wand unique is the fact that it uses 100% tourmaline infused ceramic plates, thus preventing dry and damaged hair. The advanced MCH heating mechanism also ensures that the wand really heats up within seconds, so there is virtually no waiting time when you use this curling wand. This infrared heat conditioning makes sure that the moisture is sealed, so your hair remains shiny and silky even after using the wand. The fast time that it takes for you to get your beautiful mermaid waves reduces the possibility of hair damage from prolonged heat. All those technical aspects aside, NuMe also made sure that this particular curling wand is designed with the needs of the users in mind. The ergonomic design makes this one of the most sought after curling wands in the market, because it’s very easy to use and manipulate. It also comes with rounded barrels, so to get your curls all you have to do is wrap your strands of hair around the barrels and hold them there for a bit. You can twist your hair around the barrel’s body depending on what kind of curls you want to achieve. Not all curling wands work in the same way, but this particular one is quite the winner. One of the biggest advantage to using this product is the fact that it’s probably the most user-friendly one out there. I find it extremely easy to use, because it’s so simple and designed to be held in such a comfortable manner. I never had trouble while using it, and the instructions are very easy to follow and master, there’s no adjustment period at all. The curling wand is also quite lightweight, so even if I use the wand every day, my arm wouldn’t hurt in doing so. Aside from being user-friendly, the simple design also ensures that there’s no risk of tugging or damaging one’s hair. More importantly, the Nume Pearl wand also comes with a heat-resistant glove, so that’s extra protection from the heat while the hair styling is happening. It also comes with its own stand, so when you put it down you don’t have to worry about the heat ruining the surface. Another pro to using a product as effective as this is that I didn’t have to use hair spray just to ensure that the curls will hold. The curls achieved by the wand last long enough and I didn’t need to do anything extraordinary just to make sure they hold. 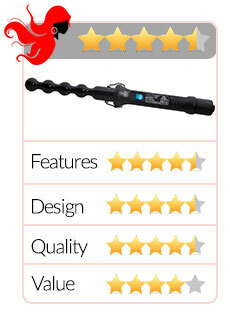 Almost every Nume Pearl curling wand review contains mostly positive comments, and the only thing I can think of that people need to watch out for is the fact that the wand could get really hot. There was one time when I forgot to wear the protective glove and I almost burned my hand. This only means that people need to be extra careful when handling this curling wand, because the temperature could go up really high. Also, the Pearl Curling wand by Nume only comes in black, so for those who want something more colorful and attractive, you’d have to come to terms with the somber look of this tool. What NuMe has given its customers is the chance to get beautiful and voluminous waves that could be the envy of many, and these waves could easily be achieved without having to step into any salon. With a Nume Pearl Curling Wand at hand, you don’t need to pay for expensive salon treatment just to get curls that are to die for. With its negative ion technology, an advanced MCH heating mechanism, and an ergonomic design, this curling wand is everything you’ll ever need to achieve those curls. The pearl in the design and this product’s unique look also ensures that the user is given the freedom to create different kinds of curls, from long beach curls to closer spirals. There’s also a way to make the curls uneven, so with this styling tool, you can design your curls practically any way you want, depending on what you think suits you. Click Here for the Nume Pearl at a Discounted Price on Amazon!